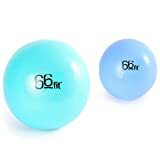 The 66fit Pilates Soft balls are ideal for your Pilates workout whilst promoting relaxation and coordination. Excellent for helping to develop strength and targeting specific muscle groups, they are also ideal for pelvic floor exercises. The 66fit Pilates Balls have an anti-slip surface which offers excellent grip.